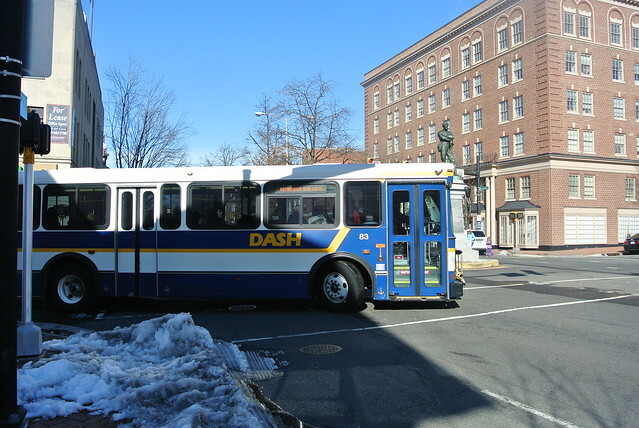 Alexandria Transit Company (ATC) has announced two community meeting dates for discussion of the new fare collection process on DASH buses. Effective April 1, 2015, riders will no longer be able to add value to a SmarTrip® card on board DASH buses. This initiative will make the DASH system the first in the region to take the process of adding value off of the bus. Wednesday, March 4 at 6:00 p.m.
Wednesday, March 18 at 6:00 p.m.
By eliminating the add value function on the bus, riders will experience a more convenient ride on DASH with less hassle, ease in boarding, and reliable departures and arrivals. The Plan Ahead…Pay it Forward Campaign will provide many useful tools for riders to learn about the numerous ways that they can add value to their SmarTrip® Card without the need of adding it on the bus. In addition to paying with a SmarTrip® Card to ride DASH, riders can always pay the $1.60 fare with cash or use DASH’s deeply discounted, money-saving monthly DASH Pass! The DASH Pass is good for unlimited rides on all DASH buses, on all routes, in any direction, for a full calendar month, and costs only $40. For details, visit www.dashbus.com/DASHPass. For more information on the Plan Ahead…Pay it Forward add value initiative, visit www.dashbus.com/PlanAhead. How Does Hurricane Joaquin Compare to Hurricane Sandy?